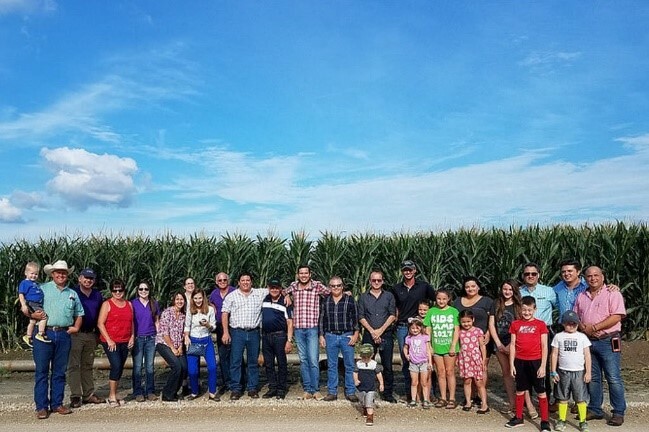 Trade team visits, even though they took place in a time of NAFTA uncertainty, resulted in increased yellow corn and DDGS sales by the team members when they returned to Mexico. Utilizing Market Access Program (MAP) funds, the U.S. Grains Council’s (USGC’s) Mexico office sponsored a group of cattle feeders Mexico, during a trade mission to Kansas in August 2017. The 16-member trade team toured Kansas feedlots, farms, ethanol refineries and a grain terminal, learning more about the origins of the nearly 360,000 metric tons of grains and distiller’s dried grains with solubles (DDGS) needed to feed cattle in northeast Mexico each year. This tour to Kansas was a reciprocal visit to feeders who visited Mexico in March 2017, which established connections. The Mexican feedlot owners were from a grain-deficit area and import almost 60 percent of the corn and DDGS needed to feed their cattle. Each month, about 30,000 metric tons of these products are shipped via rail and truck from Kansas to northeast Mexico. The cattle industry is a great example of the North American Free Trade Agreement (NAFTA) at work, with U.S.-purchased genetics and feed going into Mexico while processing and packaging moves the beef across borders to serve final consumers as part of an integrated joint venture between the United States and Mexico. The trade team flew into Garden City, Kansas, and toured Brookover Feedyard, Reeve Cattle Company and Bonanza, all in Garden City, plus visited T&O Farms near Liberal to learn about water conservation matters. Other stops included Kansas Ethanol in Lyons; Tiffany Cattle Company in Herington; and Bichelmeyer Meats in Kansas City. These visits, even though they took place in a time of NAFTA uncertainty, resulted in increased yellow corn and DDGS sales by the team members when they returned to Mexico. This type of continued engagement and promotion with major customers allows the Council to maintain market share in a region that could also be serviced by competition from South America. The Council invested $60,000 of MAP funds in this trade team’s travel, with increased sales as a result valued at an additional $3.5 million annually and a net return on investment (ROI) of $58 per $1 of MAP funds invested.